The Stonelia gentle heat essential oil diffuser is made of ceramic and diffuses your essential oils by heating them very slightly, thus preserving all their properties. With its refined lines, the Stonelia will fit perfectly into your home, bringing comfort and well-being. Its adjustable timer for 20 or 60 minutes lets you simply start diffusing your essential oils without worrying about turning your Stonelia off. Two colours are available: green aniseed and a nice taupe that will blend in perfectly with your interior design. 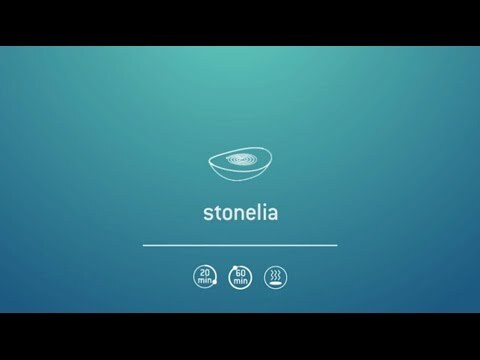 Position and plug in your Stonelia. Plug in your Stonélia then pour a few drops of essential oils (5 to 10 drops) into the spiral located in the centre of the diffuser. Then, set the timer. A light corresponding to the selected time comes on. Unplug the diffuser; you can clean it using a cloth soaked with diffuser cleaner to remove excess essential oils while still warm for easy cleaning. Do not use in the presence of children under 3 years or pregnant women. Never diffuse in a child’s room.